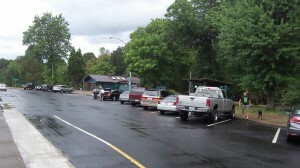 Busy place: An I-5 rest area on a rainy day in August. Thank God and ODOT for highway rest areas! And lately, let’s also thank Oregon Travel Experience, the quasi-public organization the legislature gave the authority and a modest budget from ODOT to manage 20 rest areas so far, including some of those on Interstates 5 and 84. On I-5, Oregon Travel Experience manages three rest stops: Baldock near Wilsonville, Santiam near Albany and Manzanita near Grants Pass. The organization says it strives to keep rest areas clean and safe, and judging especially by the Manzanita stop, which I found to be exceptionally pleasant and tidy, it does a good job. So it was unusual when on Aug. 16, a woman reported being attacked and injured by an unknown assailant in a wooded section of the southbound Baldock Rest Area, touching off a big search. That didn’t make the place sound all that safe, but the State Police reported later that the woman’s report was false and her injuries had been self-inflicted.